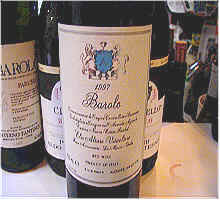 Our second flight of 1997 Barolo produced some remarkable results! The lack of rain during the critical months of September and October permitted the growers to harvest their Nebbiolo grapes at extraordinary levels of sugar. While some people view high sugar content as a mark of quality, keep in mind that the naturally preserving acidity tends to be reduced as sugar levels rise. 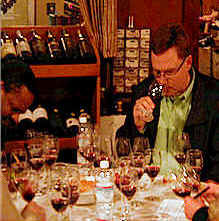 Further, many vintners experienced difficulty in completing their fermentation. While the sugar content makes for dizzying levels of alcohol in the wines, the extreme praise for the vintage has led to price increases which can be equally dizzying. The tasting numbers were incredible! One wine was slightly ahead of the group. But second place through 8th place were separated by a mere SEVEN POINTS! Two sets of three wines were tied statistically! We break the ties by the greatest number of firsts, followed by the greatest number of second place votes. Having been tabbed by The Wine Spectator as one of its Top Ten on the Top 100 list for 2001, we had high expectations for this wine. The first critic felt it had "highly extracted fruit, some road tar, truffles and saddle leather" notes. Another found it displaying "leather, black licorice, tart cherries and it's very astringent." A third individual felt the "tannin covered the fruit." Someone else thought this "opened more than most and it was very tight at the start of the tasting." Another person said it's got "tobacco notes and good varietal character." I thought this displayed medium intensity for Nebbiolo, with a bit of a berry note and some dusty elements. A hint of spice was pleasant, too. I tasted this wine first (it was wine "H" in the line-up) and felt it had the least structure and was the most soft and ready-to-drink wine. Interestingly, as most tasters evaluate the wines in alphabetical order, a number of comments about it being extremely tannic may signify the "build up" or cumulative effect of being tasted as the 'last' wine of the flight. As for the price, one might truly be "Pio-ed". One star (three star scale, 0 being average, 3 being exceptional). 7th Place: CAVALLOTTO 1997 BAROLO "Bricco Boschis"
One critic knocked this wine for having "the weakest aroma...there's nothing much here on the nose." A second taster expressed disagreement, finding "raspberry and cassis along with a bit of tar." Someone else found "cherry & chocolate" notes which closed up briefly and then blossomed. Another person agreed with the "chocolate" element, while another said this has a "wall of tannin." One person felt this was "spirituous and brandy-like, turning to oak and woody notes." Another found "stemmy or herbal notes," while yet someone else detected "un-ripe red fruits with ample bitter-sweet fruit, herbs and oak." While I found some very attractive notes here, such as spice, berries and nice fruit, I ranked this poorly due to the intense forest-floor and earthy fragrances. I like the mushroomy flavors and find the tannin and astringency of this to warrant many years of cellaring. One to one-and-a-half stars. Eight to 15 years of cellaring. 6th Place: ALESSANDRIA CRISSANTE 1997 BAROLO "Roggeri"
This wine found many fans and many detractors. One (former winemaker) critic was "distressed by the skunky nose and prickly note on the palate, perhaps the result of some malolactic fermentation having taken place in the bottle." A physician detected a "band-aid" aroma. Someone else diagnosed this as being "old and past its prime." Another fellow described this as showing a "Burgundian 'stink,' with ripe fruit and good balance." Someone else said it's "missing the ripe fruit and has tart acidity, some plum skin notes, cedar and a short, herbal finish." Another person detected "H2S." One old-timer, a fan of old-school Barolo, found "forward, plum fruit...it's young and typical of traditionally-styled Barolo." My descriptors include tar, truffles, earth, some of those faded rose notes and pencil lead fragrances...definitely not everyone's idea of Barolo, but I recall many old bottles from my travels in Piemonte. It's a real throw-back to old styled Barolo and, I felt, a really good example of old school. I like both modern, fruity examples and this old style, too. Two-and-a-half stars. Five to 15 years of cellar ability. 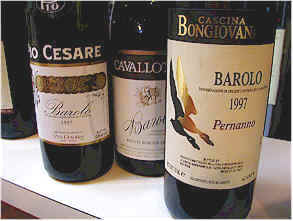 5th Place: CASCINA BONGIOVANNI 1997 BAROLO "Pernanno"
We heard from one taster about this wine's "velvety texture, ripened fruit notes, paraffin wax-like character, along with some dusty, cocoa-like notes and blackberry fruit." Someone else claimed the wine has "harsh and bitter tannins" and it might be good with a "pasta with a tomato cream sauce, as it has some plummy, cherry and raspberry notes." Another taster found some "tangy notes which covered the fruit...a bit of tobacco." One other taster felt "it changed quite a bit over the course of the tasting...but it's bitter and too acidic, though it has nice fruit." I felt this was another "old school" Barolo, having hints of wet earth and woodsy, forest-like scents. It displays some dried cherry fruit on the palate and plenty of astringency, having eight to 15 years of tannin. One star. 4th Place: CONTERNO FANTINO 1997 BAROLO "Parussi"
The first person to offer an opinion found lots of "sweet, vanilla and cherries...almost Port-like and too sweet to pair very well with food." Another taster noted "black cherries" with some "earthy, minerally and lead pencil notes." Someone felt this had the "strongest body with burnt 'Fruit-Tart' notes..." One person echoed the "burnt" notes, adding "it's harsh and like a dry Port with a very hot finish." One fellow found notes of "prunes and apricots," adding these features made this attractive. I found some sweet cedar and vanillin notes on the nose. I am not sure I would identify it as Barolo, but it was a pleasantly-made, internationally-styled red wine. It certainly has the "grip" of Barolo! The tannin level is high and gives this a chance to cellar nicely for 8-12 more years. One star. 3rd Place: ALDO CONTERNO 1997 BAROLO "Cicala"
A fan described this as having nice "barrique notes and a good balance of fruit. There's plenty of depth..." Someone else found "nice tobacco notes and black licorice, some forest floor notes, but it was sharp and tart." Another taster detected "tangy tangerine or mandarin orange-like acidity." A critic knocked it for its "short finish." Another person said this was "the lightest in body." Someone found "a lacquer note on the nose and some mushroom," while another taster felt the "nice berry notes stood out." One person found it to have "sweet, cordial flavors." I liked the hints of spice and berry here, finding the wood a complimentary character, rather than the over-riding character. Some white pepper spice mingles nicely with the fruit/cedary/woodsy complex on the nose. The wine has terrific structure for cellaring, being quite astringent and showing plenty of fruit. 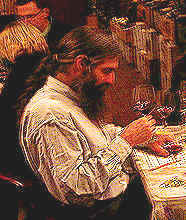 It is certainly not "old school" winemaking, yet it's not the new-wave, maximum wood school of winemaking, either. Classy. I'd give it five to ten more years, though it's probably quite a match for red meats right now. Two stars. 2nd Place: ALDO CONTERNO 1997 BAROLO "Colonnello"
"Abundant, nearly sweet black fruit notes with vanillin, new oak, jammy, cherries and a sweet finish" were the elements found by the first taster. Someone else described this as having a fragrance reminiscent of "Bourbon barrels...nicely oaked with hints of plum sauce and some curranty notes." Another taster said this was "Over the top...too oaky and too Port-like and way too sweet." Another critic found a hint of "grapefruit," adding "this needs food." Someone else found "nice, leathery notes but not a great finish." Someone else said it's "thin on the finish, showing just the oak." One other person found the oak, but said "it's not Barolo." I found plenty of vanillin and cedar notes as the initial fragrances. You might not find the "Barolo" here, at first, especially with such a nose. Very modern style. On the palate the wine is tannic and has some of the more typical notes I associate with Barolo: earthy, light woodsy elements and such. It tastes more like "old school" winemaking, though the nose is more like that of a modernist. One-and-a-half stars. Five to ten years of cellaring potential. Elio Altare sued his cork supplier, claiming the corks provided by the company were responsible for "tainting" his wines in 1997. After a long court case, the firm, reported by several news organizations as the German firm called Gltig, agreed to pay Altare something like $500,000. A report in the Piemontese newspaper "La Stampa" says Altare was able to salvage 5,000 bottles of wine which are being sold as a "souvenir of the battle." The battle, by the way, was characterized as "David versus Goliath." We recall David slaying Goliath with a rock. This time he did it with a cork! The first Robert Parker to speak about this wine found it to be "pleasant, with gobs of sweet fruit, a creamy richness and rose petals and truffles on the finish." Someone else described it as being "well-balanced between cherry and meaty notes...it's more of what I expect from Barolo." Another taster detected "fruit, forest floor and some tobacco notes." Someone else felt this had "the best nose." Yet someone else found it "more extracted than concentrated." I liked the vanillin notes up front, with hints of a dusty character. I felt the wine showed better on the palate than on the nose, having plenty of fruit and very deep flavors. The tannin level is balanced and the wine has enough fruit to match the astringency. Five to ten years of cellaring time. Two stars.